Sometimes things just fall into place. 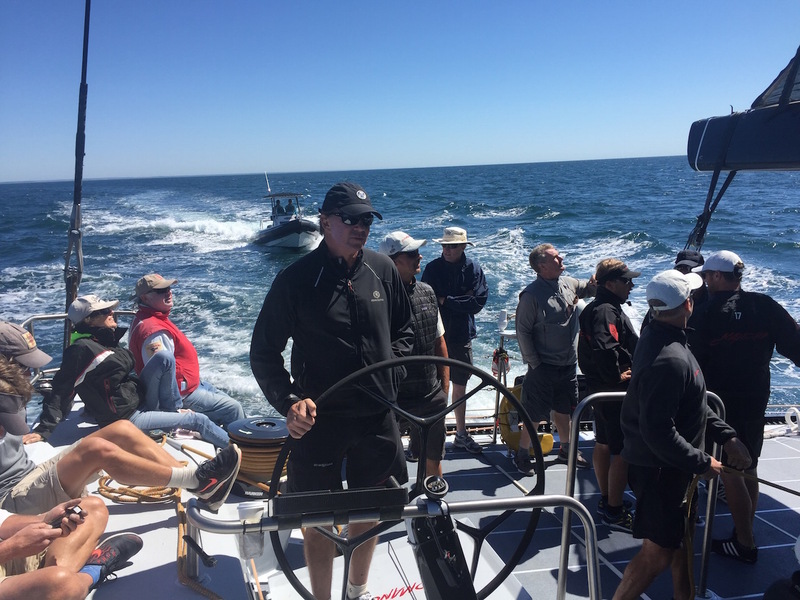 Like yesterday’s little pre-Newport Bermuda Race practice run we did from Newport to Block Island and back on Jim Clark’s 100-foot drag racer Comanche. 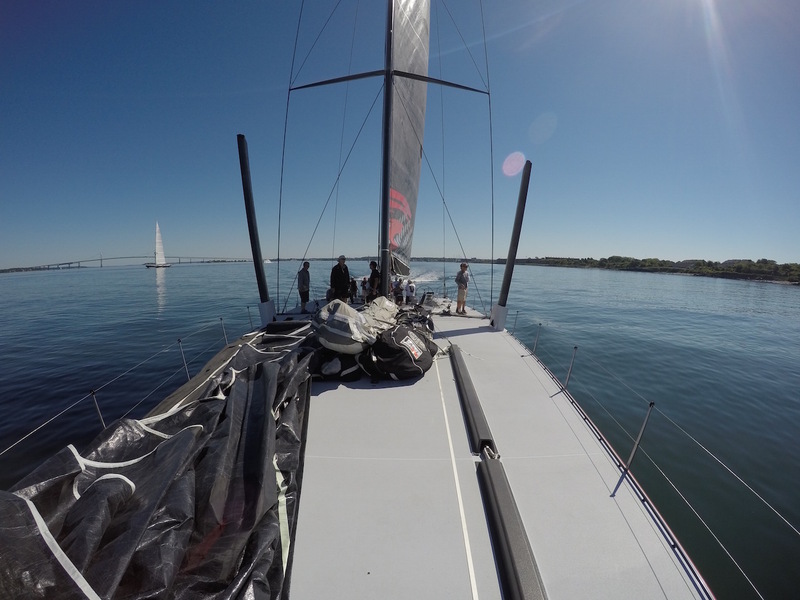 And all I can say is my little 25-second video clip of Comanche doing 25-knots, in like, 12 knots of breeze, really doesn’t really do this remarkable monohull justice. The sun shines, and the sea breeze builds, and the SOG hums up to the mid-20’s, and the pros: Ken Read, Stan Honey, Kimo Worthington, Shannon Falcone, and a virtual horde of tough guys who have done lots of laps around the watery side of our planet and make harnessing Comanche’s considerable power look so easy. I know you’re expecting all sorts of spray and drama but I love the peaceful beauty of this shot. Especially since many superlatives (powerful, record-breaking, ummm…fat bottomed) are often used to describe Comanche, but “beautiful” usually isn’t the first that comes to mind. And this really gives you a feel for the scale of this monster. Check out how small the guys look compared to the retracted boards. 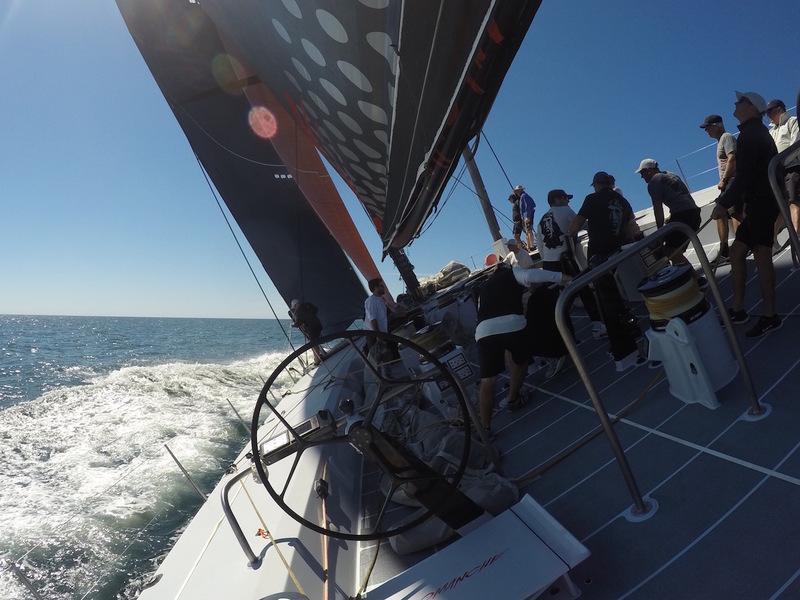 A boat this wide with water ballast and a canting keel pushes water around in interesting ways. Comanche’s “air craft carrier” deck can also swallow crew like crazy. 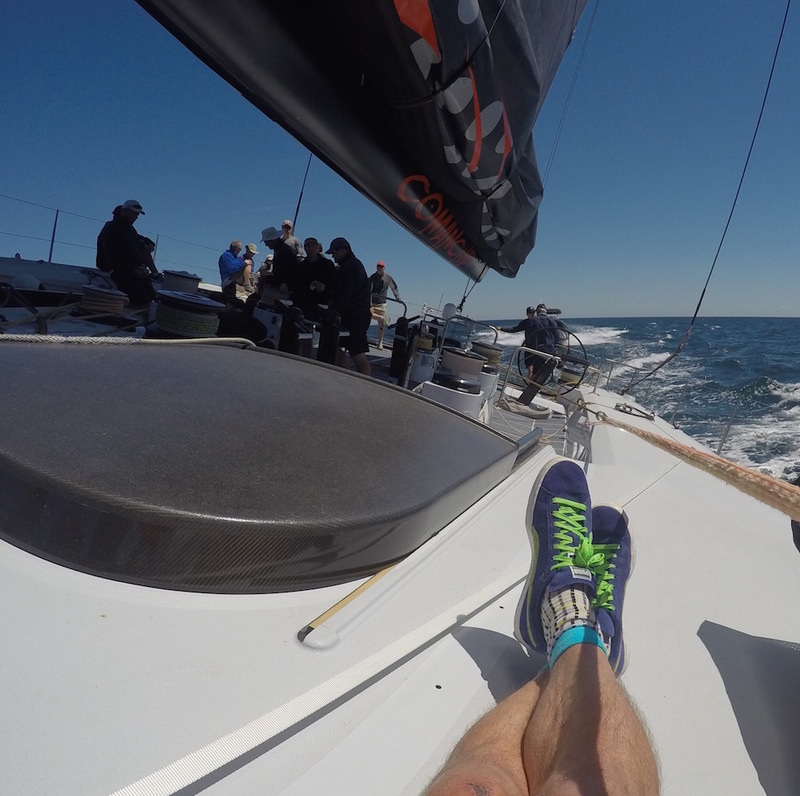 This shot shows about 20 people on deck, and yet it was easy to find plenty room for myself. 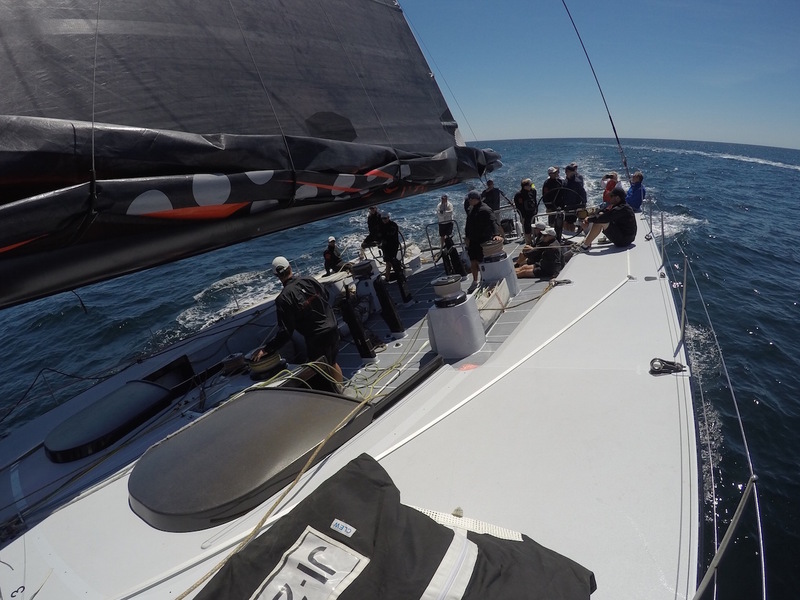 It’s just another day in the office for Ken Read and crew who went through sail changes and the specialists checked out all the boat’s systems while he mixed in some small talk with guys like me in preparation for what they hope to be a record-breaking run to Bermuda this weekend. Behold Comanche’s optimum heel angle (more or less). Comfortable right? This is how the boys get the drag of Comanche’s considerable booty (that provides amazing stability off the breeze) up and out of the water when they go upwind. 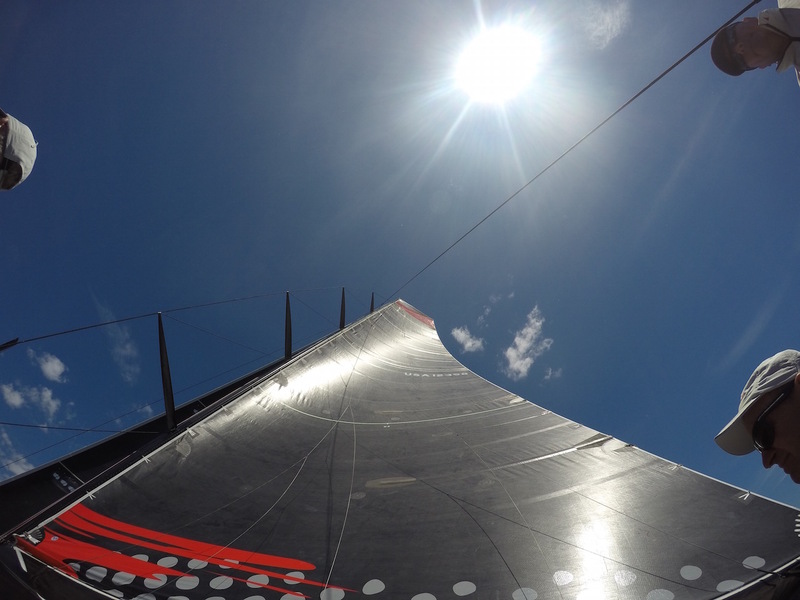 And heel angle is precisely controlled with the canting keel and water ballast along with sail trim. 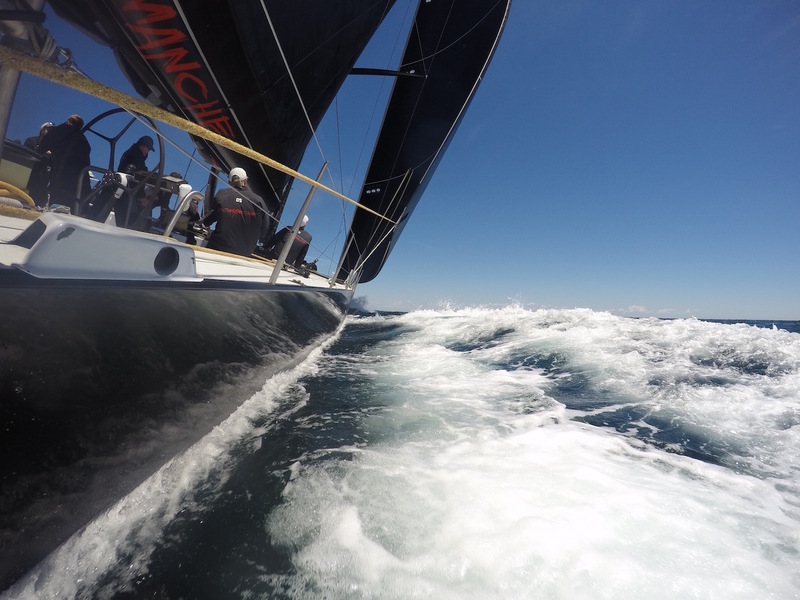 Comanche’s big main is like the V-8 engine in a muscle car. Pure power. Kenny gave all us “guests” a chance to drive. And you well know I’ve never shied away from a good selfie, but, this shot of another lucky “VIP” at the helm really gives you a flavor of how many people it takes to push a boat like this to its limit. This shot is even better. The aft deck is kinda-like what would be like if you were on the deck of an aircraft carrier (complete with all the crew you need to launch fighter jets) that heels 25 degrees all the time. Yes, I did get a chance to do my requisite #socksoftheday shot. 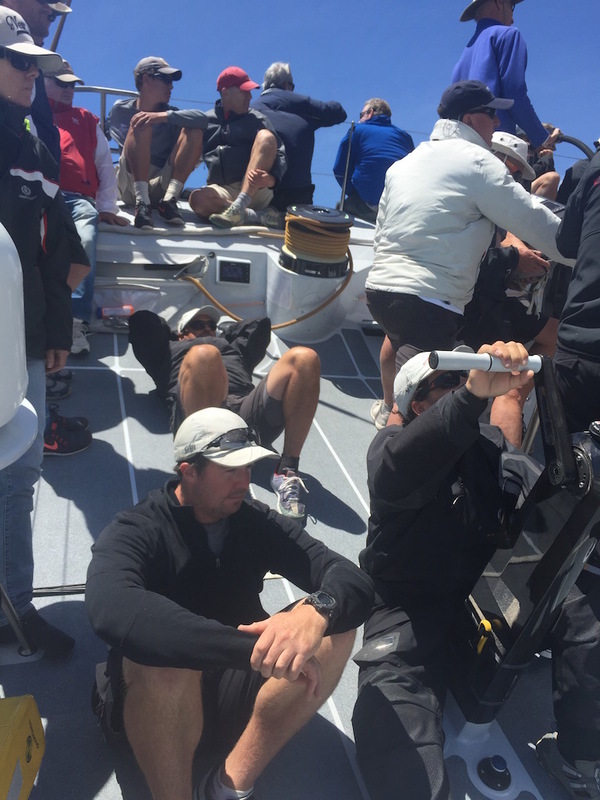 But nothing was more impressive than seeing how some of the best, most experienced offshore sailors in the world dealt with the strop that broke and sent the tack of the big A-sail flying off into space. There was no yelling. No alarm. No sweat. No stress. 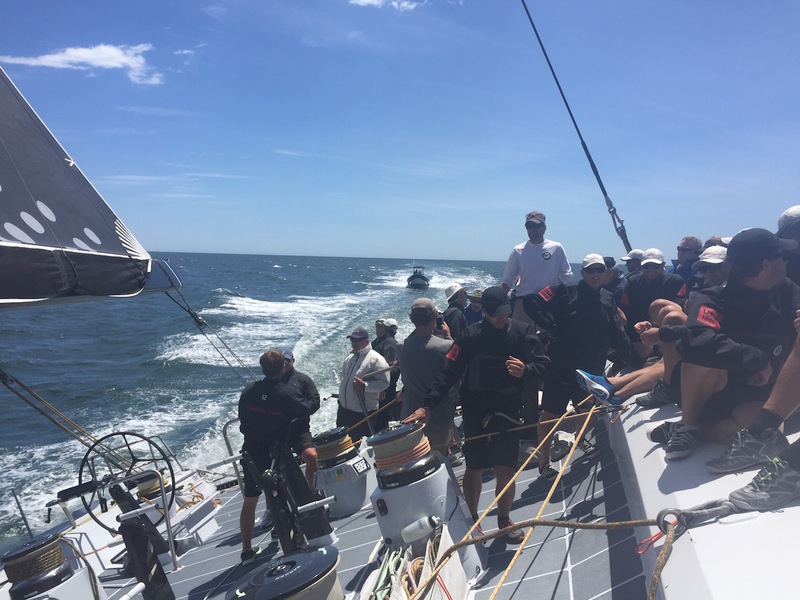 Just hyper competence and coordination between a large group of tight-knit guys on a 100-foot-long surfboard powered by a dizzying, and potentially dangerous array of sail configurations. All they needed was a little time. A little blanket by the main. 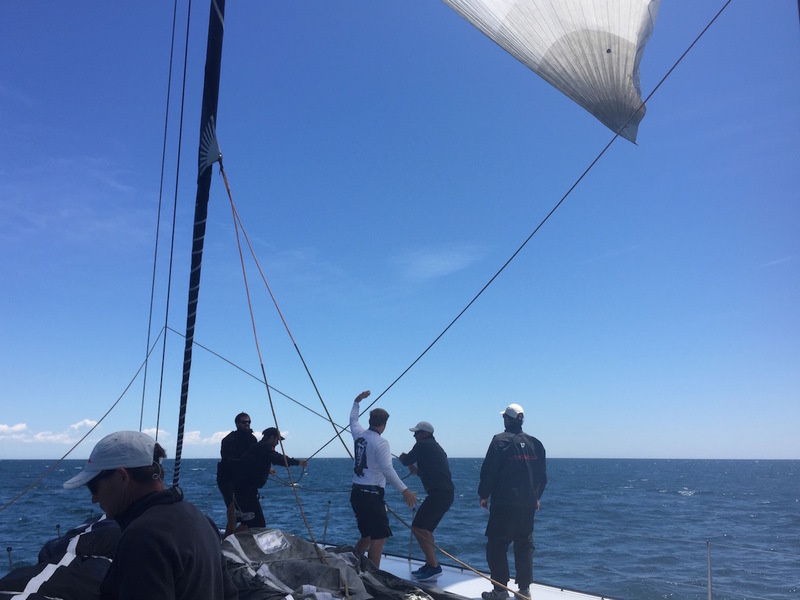 And a heaping helping of skill that comes with 100’s of 1000’s of offshore miles to bring the big A-sail under control, re-rig a new strop, re-hoist, and the roll it up like the jib on a Beneateau 40. And with the Newport-Bermuda forecast calling for big breeze this weekend, something tells me Comanche may break Rambler’s record (just over 39 hours at a pretty pedestrian average of 16 knots set in 2012) by almost a whole DAY!